Since its 1980s inception, Bill Bruford’s Earthworks quartet has had an unusually expansive sonic palette. Orchestrating some of the best Earthworks material for a 10-piece band is logical in theory and, judging from this release, exciting in practice. Captured live at New York City’s Iridium in late 2004, Bruford and saxophonist/arranger/fellow Brit Tim Garland join pianist Henry Hey, bassist Mike Pope and a roster of top American soloists, including sax/flutist Steve Wilson, trumpeter Alex Sipiagin and (on two cuts) trombonist Robin Eubanks. The piano sound is marred slightly by distortion, but Hey’s solos are consistently stirring. The first three pieces, “Libreville,” “Up North” and “Pigalle,” date back to the Django Bates/Iain Ballamy years, as does the penultimate track, the ballad “It Needn’t End in Tears.” Garland revitalizes this older material with his punchy charts. The edgy substitute chords on “Tears” are a treat, giving Pope plenty to chew on during his solo. The newer pieces, previously heard in quartet form on the live discs Footloose and Fancy Free and Random Acts of Happiness, acquire a new freshness in the large-group setting. 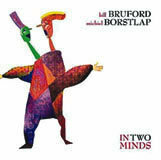 Bruford’s drumming is as strong as ever, and Garland’s solo voice is indispensable–his mettlesome bass clarinet intro to “Bajo del Sol” stands out.